A colour change which can be found in many older tribal rugs where the colour of the wool or dye has variations. This usually appears in blocks where the weaver changed to a different batch of wool in which the natural dye due to the inconsistant dying process has given a different shade or hue. This is a sign of a natural or vegatable dyes and materials, some buyers like rugs with an abrash whereas others don't, it is really a matter of preference. Afghanistan located east of Iran and northwest of Pakistan, and has a strong tradition of rug-making particularly with Ziegler, Khal Mohammadi and Afghan Red Rugs. 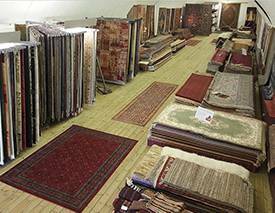 Many rugs made in Afghanistan are exported via Pakistan due to trade restrictions. Persian for "scattered," afshan rugs typically have an all-over design. This is a pattern which is repeated over the full rug, see our 'Rug Design' article. Synthetic dye created around 1870, this dye fades with age and exposure to sunlight. There does not appear to be a definite age when a rug becomes antique but it is generally around 80-100 years. In America some rugs are described as antique at 50 years old. Mercerized or brushed cotton used to give rugs a plush feel without the cost. A type of knot - see our 'how rugs are made article'. Fine carpets woven from the 15th to 19th Century in France derived from the Moorish weavings, the original Aubussons were flatweaves with no pile. A type of power-loom used for making detailed machine made rugs and carpets. Republic to the north of Iran, previously part of the Persian Empire. Colour run occuring when rugs are washed if the wool was not washed fully after the dying process, can also happen if a rug is flood damaged. Can be a problem with some synthetic dyes. The process of wetting a rug, stetching it out and pinning it down, letting it dry and repeating to remove folds or wrinkles. The frame on the outside of the rug, there can be multiple borders on some rugs. A motif shaped like a flower, also the Farsi word for immature flower or palm leaf copied in Scotland in the 19th Century for Paisley shawls. 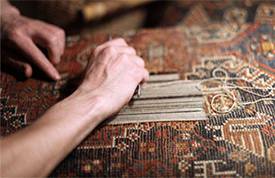 A small tuft of fibres removed from a rug can be tested by burning, e.g. silk smells similar to human hair. The process of cutting out parts of a rug round a design or motif to enhance the detail or create a 3D effect. Used to describe rugs found in the Caucasian Mountains and Russia. Synthetic dyes often which are not colour-fast. The Farsi word for wood - these rugs are designed for Western tastes and are made with natural or muted colours, see Ziegler. A reversible flat-woven rug often in bright colours. 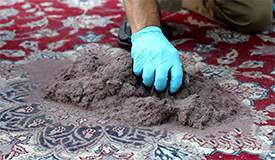 Deterioration of the rugs foundation caused by it drying up and becoming brittle; this can also be caused by exposure to water rotting the materials in the rug and the damage is told once it drys out. The sides of the rugs (adjacent to the fringes) which can be selvaged or overcast to create a more durable finish. A large octagon design like a stamp usually set out in a grid formation, similar to the gul print only much larger. The official language of Iran, spoken in many parts of Afghanistan. The largest area in a rug, enframed by the field. A technique for weaving that can involves no pile, the weft and warp are intertwined in different colours to create a design. Used in Gelims, Soumaks, Dhuries etc. The warp and weft of a rug onto which the knots are tied. The warp of the rug which extends beyond the end of the pile, usually tied. A type of rug with very thick pile and normally very plain designs. The word Gabbeh means unclipped explaining the long, think pile. A rug with square compartments filled with different floral motifs. A type of flat-woven rug. A type of motif used in rugs, particularly Turkmens, see our 'Designs and Motifs' article. 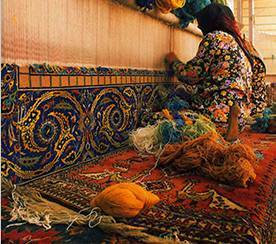 A famous master-weaver who wove between 1800-1890 in the Tabriz region. Turkish word for carpet - HALI is an international specialist handmade rugs magazine. Used to describe rugs made by hand. Can be used to describe, hand-woven, flatweave and hand-knotted rugs. A common motif of a flower encompassed in a diamond, see our 'Rug Design' article. A knot similar to the Persian or Turkish knot but passed around two warp strings making the time to knot the rug reduce considerably. A natural plant fibre used to weave Jute rugs popular in modern and 'green' interiors. An Afghan master-weaver made famous for his excellent red-dying process and his Khal Mohammadi rug designs. The luxurious wool from the underbelly of goats typically used in very fine rugs along with silk. A popular motif covering the field in daisies, see our 'Rug Design' article. A type of motif shaped like a lotus palmette. A rug woven in Iran. A famous roaving tribe of village and tribal weavers. Another motif used in many city rugs such as those from Nain. A circular arrangement of floral motifs radiating our from the centre. A rug shape which is often used in stairways and halls, long and narrow. From 1499-1722, the period which saw the art of Persian rug making develop beyond anything else on earth. Similar to embroidery this flatweave technique produces a herringbone effect, a one-sided Gelim or flatweave. A type of knot, see our 'how rugs are made' article. Rugs woven in Afghanistan under the occupation of Russia in the early 1980s, the meaning of these rugs is often hotly debated with some believing they are pro-war while others believe they are against war. Many of these rugs are actually woven to be sold in the West where there are many collectors, Little-Persia do not have any war rugs but can easily source them for any collector. The horizontal strings used to keeps the rows of knots in position. A Manchester based German firm (Ziegler and Co.) who recruited Persian and Oriental weavers in the 1700s to produce a rug designed for the West, these rugs known as Zieglers or Chobis are natural in colour and suited to most modern interiors.